Any factory is only as good as its equipment; in addition, any equipment is only as good as the maintenance it receives. If you own or manage a production facility and don’t have your employees trained in conveyor systems functions, you may be losing out on potential revenue. Keep reading to learn more about why this is the case and what you can do to prevent it. Conveyor systems are complex mechanical constructions designed to move items from one place to another without much human help. They are particularly useful for moving extremely large items that would be nearly impossible for one person, or even a team of people, to handle on their own. They can also produce impressive amounts of extra revenue by speeding up basic processes; one solar panel company was able to increase the volume of their production by over 1000% in a single year just by installing conveyor belts in their existing facilities. Any production facility dealing with more than minuscule volumes of product will have at least a few of these pieces of equipment around to make things run more smoothly and efficiently. The goal of production is always to maximize the output with the time and resources you have. It’s difficult to add more workers or more equipment without significantly increasing the cost of operation, but there’s one key area where most facilities have considerable slack: downtime. It’s been estimated that the auto industry, for instance, loses $22,000 a minute when unplanned interruptions to the production process take place. One of the major reasons for these interruptions is failure or breakdown of vital equipment. While conveyors are not the only pieces of machinery that are prone to having problems like this, their role in keeping things moving inside the factory makes them especially important to keep functional. If they are damaged or otherwise unusable for a time, all production will have to stop past that point. Regular inspections, tune-ups and minor repairs can greatly alleviate this problem, but many facilities have very few employees with the knowledge required to do this. With more workers with the correct skills, these minor interventions can happen much more regularly, making breakdowns much less frequent and reducing their total impact. It is important to keep in mind that even perfectly-maintained, completely unbreakable conveyors would not be able to eliminate downtime completely. This phenomenon happens for a multitude of complex reasons, and equipment failure is only one of them. However, cutting down on it as much as possible will yield significant savings for most companies and is almost certainly a solid goal to invest in. Spreading knowledge of how to maintain and repair conveyor systems will keep those systems in operation longer and result in fewer production disruptions. Even if you’re sold on the idea that your employees could benefit from knowing more about the conveyor systems your company uses, it may be tempting to skip formal classes. This would be a big mistake. These systems come in a multitude of different configurations, and most workers will not have the complete grasp of each type. For example, while the most common type is the simple horizontal conveyor line that moves luggage around the airport, there are also vertical kinds to pull objects up to a higher location within a space. The principles behind each of these set-ups are very similar, but they are not constructed the same way. The horizontal conveyor line can also be built in dozens of different ways, from vibrating to pneumatic to aeromechanical and many more. Further, even the simpler systems become more complicated as they scale up in size. A larger conveyor requires a larger motor and often more component parts to function effectively. Troubleshooting and mechanical work can become more difficult in these instances, particularly without clear guidance from a proper training course. All of this means that even if a person understands how a basic conveyor system works and how to safely handle it, that knowledge may not extend to all the systems they might be called upon to handle. 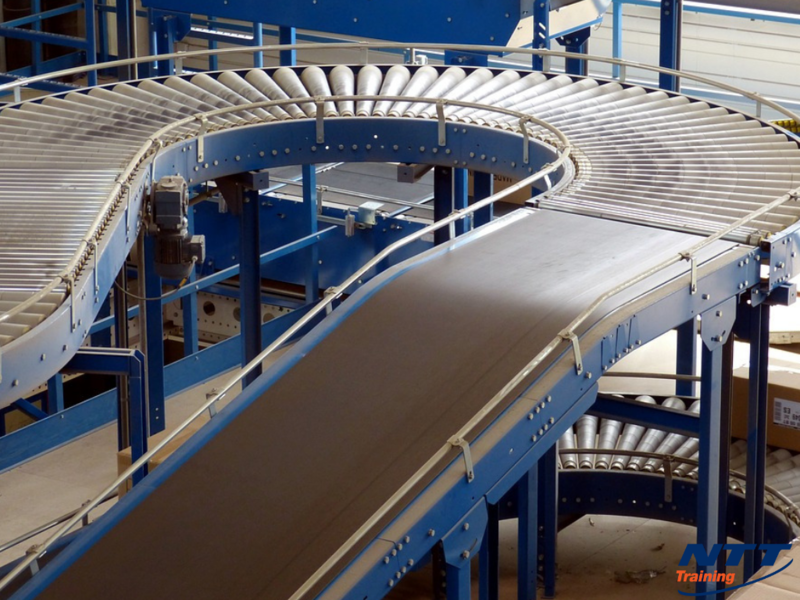 Many facilities use several types of conveyors in their production process, and even those that currently do not should remain open to the idea that they may choose to do so in the future. A facility with employees who have received education pertaining to all kinds of different conveyor systems will always be in the best position for continual improvement in the near term as well as for potential future growth. Now that you know why conveyor systems courses might benefit your operations, it’s time to take a look at the on-site Conveyor Systems course offered by NTT Training. This course will teach your employees everything they need to know about how conveyor systems work, how to maintain them as time goes by, and how to troubleshoot and solve any problems they might have as well. Contact us at NTT today and let us tell you more about how you can put you employees to better use working on these vital systems.